Long blonde hair is the real definition of elegance, femininity, and refinement. Whether you have some long curls or waves blonde will always look magnificent on you, and this is regardless of your skin tone or face shape. All you need to do is to find a hairstyle that works well for you and also to make sure that the blonde shade is in an attractive pattern. If you want to wear this lovely shade here are 50 top notch and luxurious styles that you can try out. The hand painted brown shade gives these long blonde locks a distinctive tone but the highlight of the design if the styling. To create it you should sweep back your tresses and then knit them into two messy boho fishtails at the back to create a simple updo. These blonde locks also have a hint of brown that creates a fantastic color melt. However, the inventive styling is what makes this a top notch headdress and it entails pulling all the strands to one side. You should then knit the strands into a cute and casual looking pull-through braid and leave it hanging over the shoulder. An effortless hairdo like this one will only take you a few minutes to create, and you will not need to be excellent at braiding hair. 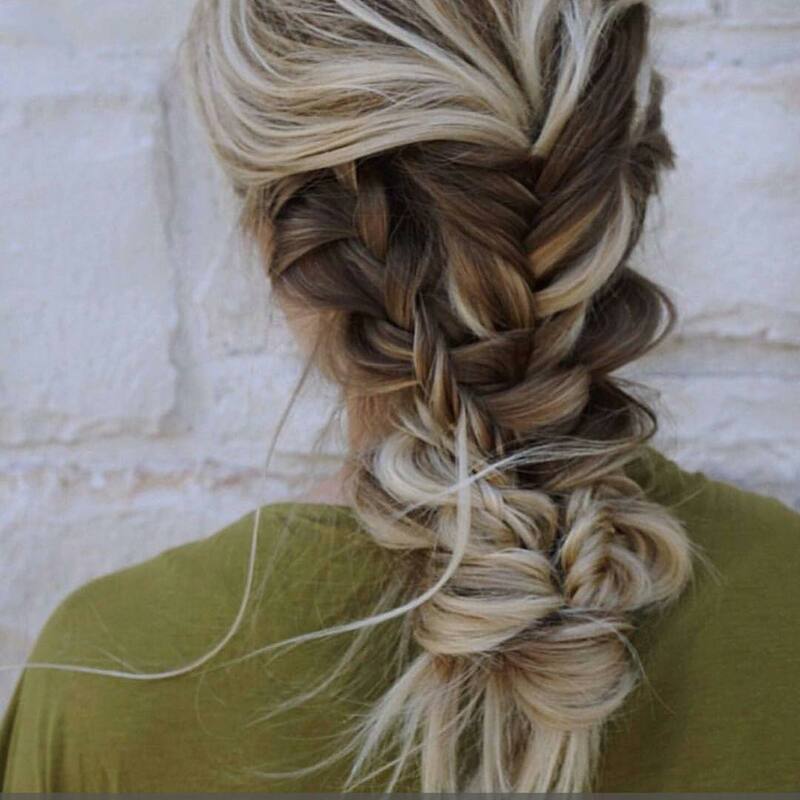 It only entails twisting the strands loosely to form a long and straightforward braid with a few free locks hanging on the side. The hand painted white blonde shade with a subtle hint of pink is also very classy. Fair amber blonde is perfect for ladies who prefer to wear dark shades on their long mane. This style also has a beautiful sombre pattern that comes from transitioning drastically from a dark brown base to the blend of fair amber and blonde. The styling is also top notch, and it entails knitting some of the strands over the rest to create a half up design. You have to get the color combinations right if you want your long hair to look this adorable. And this can only be possible if you know how to blend browns and blonde using balayage. Once you have the color, you only need to give your long curly hair a simple center part and sweep it into a face frame before finishing with a headband accessory. 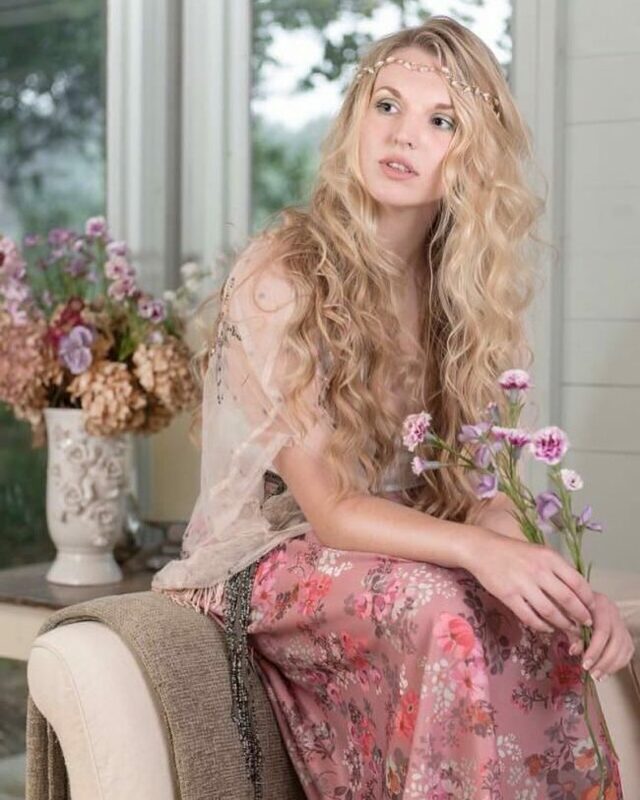 The natural and relaxed look of this bohemian hairdo is what makes it perfect for both casual and formal events. If you are not lucky enough to have this shade as your natural hair color, you can still achieve it using balayage. The styling is also very straightforward as you only need to weave a neat crown braid that wraps around the head over the rest of the free flowing locks. A lovely braid like this one that incorporates all the strands is perfect for ladies that want something elegant that they can create fast. It entails knitting all the strands into a massive French braid that flows all the way to the back. These strands also have a lovely color design that involves transitioning from a brunette base to a blend of brown and blonde. This fantastic shade is what you get when you introduce a dazzling honey brown hue to your natural blonde shade. With such a lovely color it is only fair to ensure that you give the locks a creative styling to enhance the appearance. In this design, a simple twist at the back to create a half-up style is all that you will require. A style like this will make a bride want to have a wedding every other weekend because it is just breathtaking. The color melt between blonde and brown gives the long hair a breathtaking shade. 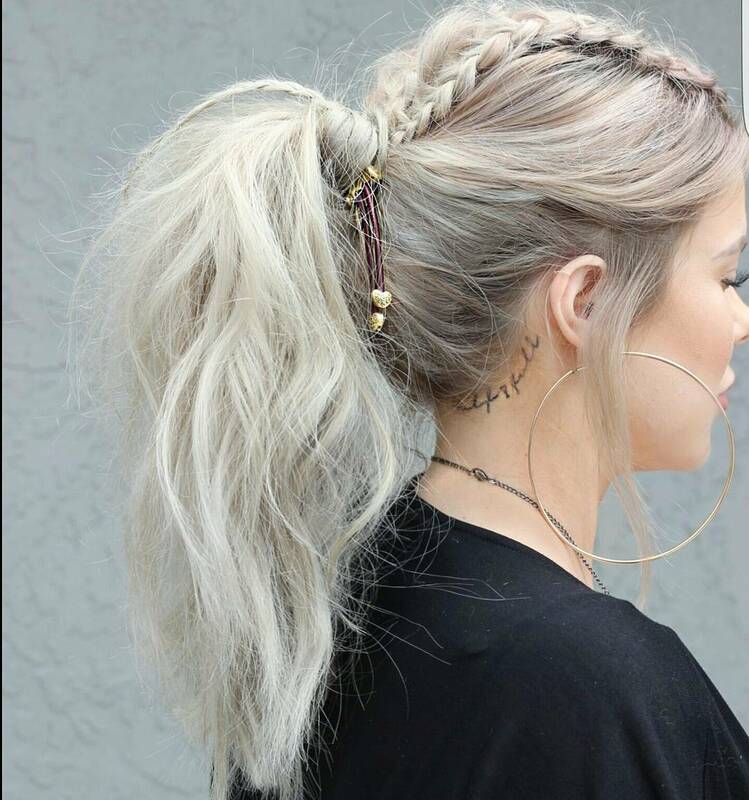 To style it you should pull and wrap it into a high updo and use pins to hold it in place while leaving a few free locks hanging on the side. For accessorizing, you should wrap a cute flower crown around the updo. Once you get the color right, this is one of the easiest hairdos that you can create with your long hair. The color is also easy to achieve because you only need to hand-paint your hair with a glossy golden blonde shade while leaving the roots dark for some contrast. To finish the design you should pull your strands back and tie them into a simple ponytail. 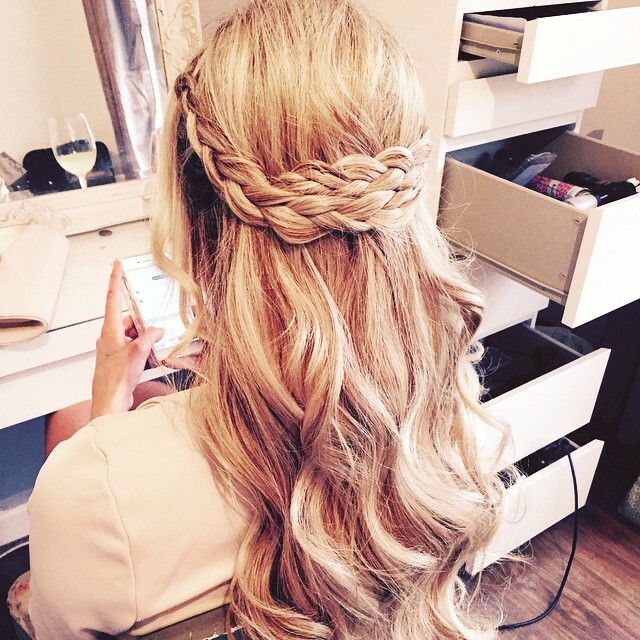 Braiding your long blonde hair is one way to ensure that it always looks stunning. However, you still need to get inventive with the technique that you use to knit it. 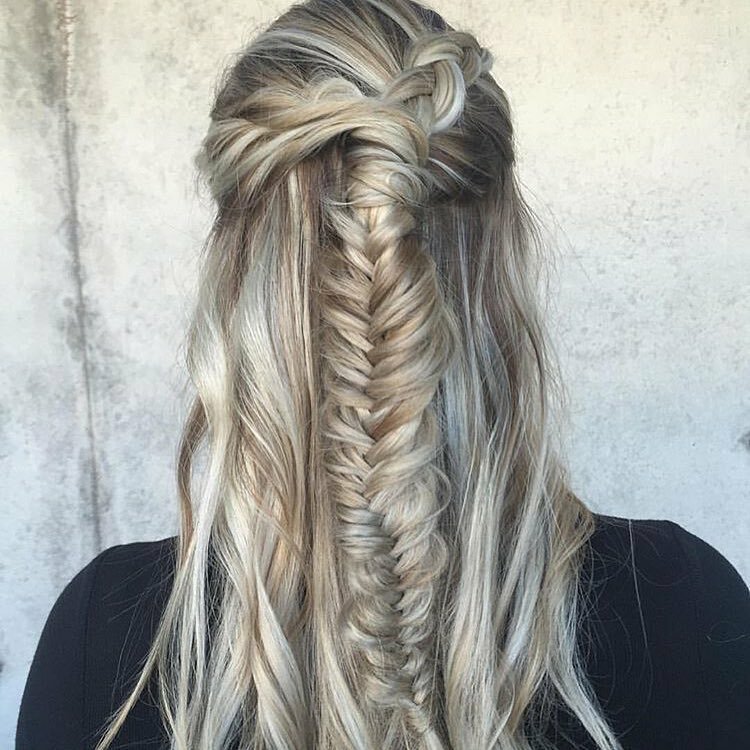 In this style, for example, you should pull the hair to the center of the head and spin it into a massive Dutch braid that flows to the back but transitions to a tight fishtail. 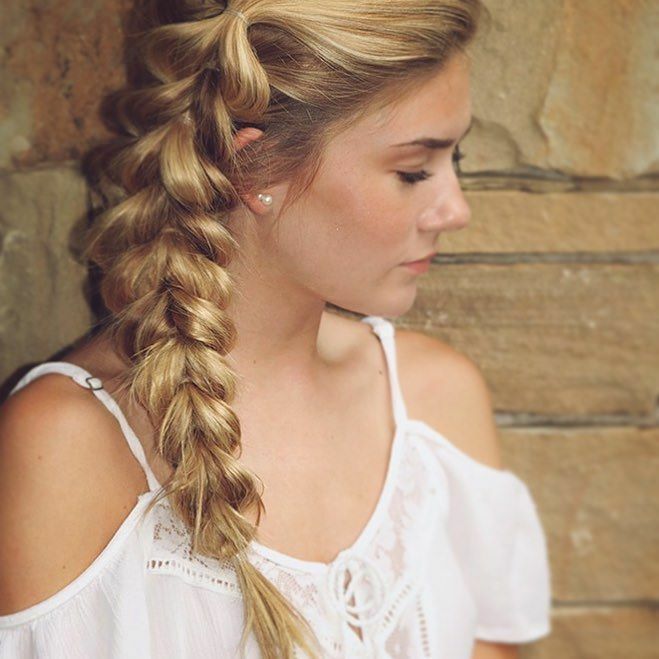 Some fancy braids like this will make your blonde hair look splendid, and although they look sophisticated, they are still achievable with a little effort. To replicate this look, you should knit two small braids on the sides and a medium size one that starts at the front and flows to the back while combining with the others to form this fantastic pattern. The color is an ombre that entails transitioning from a honey base to a light blonde shade. This funky hairdo is also about getting the hand painted ashy blonde shade right because the styling is very easy. 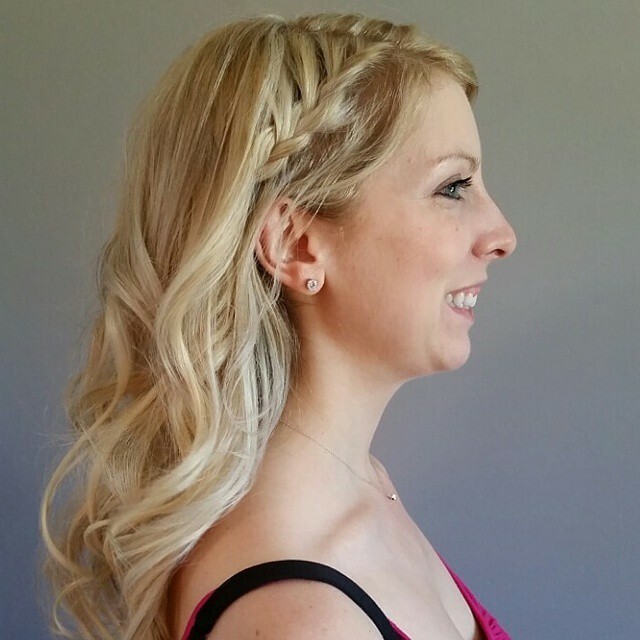 Once you have the right shade, you will only need to knit a simple pull through braid that starts at the center part and flows on one side while leaving the rest of the hair free in their natural flow. Everybody will want to have a second glance at a sharp and elegant hairdo like this one. It is a very fashionable design that you can create by pulling your strands to the center of the head and tying them into a tight knot. The color also makes this hairdo look charming, and it entails blending baby pink with a white blonde hue. 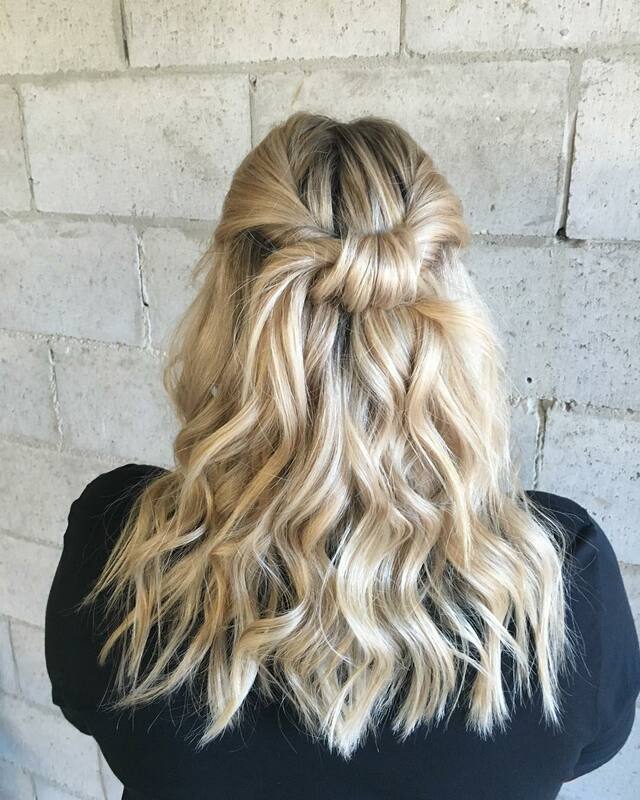 These wavy blonde locks have a subtle hint of gold that gives them an attractive shade and so you do not have to do much to make them look elegant. A center part to control the flow of the long blonde hair and two micro Dutch braids at the front are enough to create a stunning design. The dazzle on these golden blonde locks is just fascinating, and you can always be sure of a head-turning headdress with such hair color. 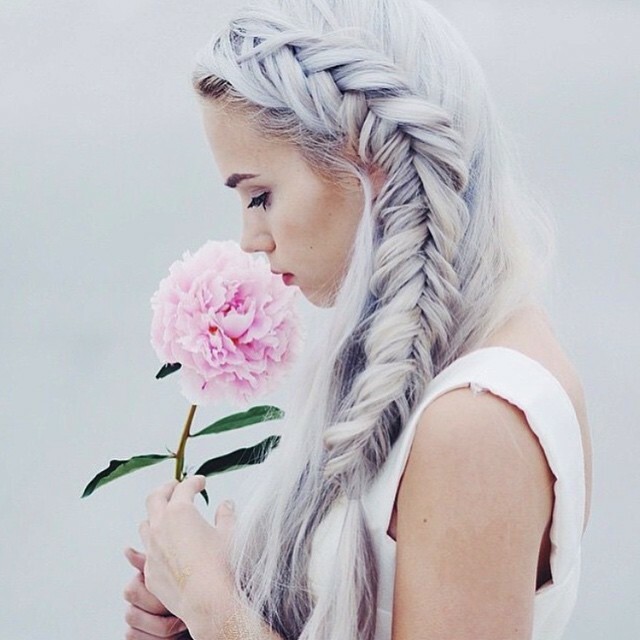 These locks also have an amazing style that entails sweeping them to one side and knitting them into a loose side braid. 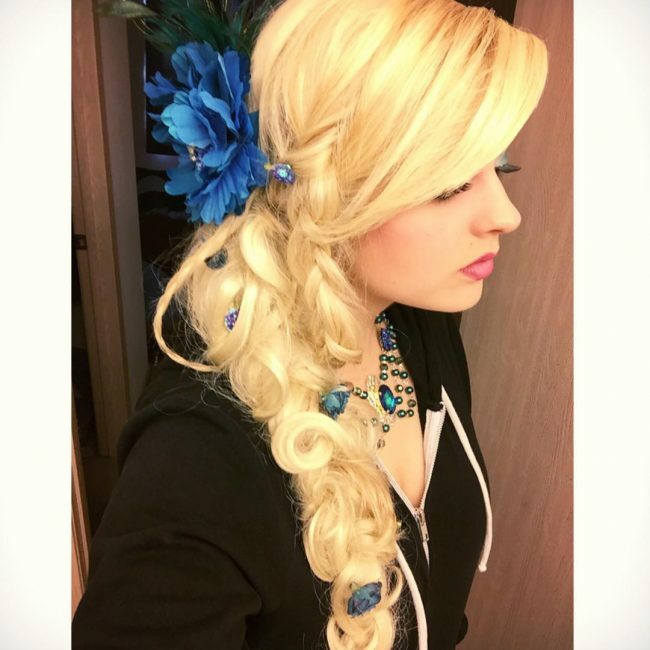 You should finish the style by accessorizing with a large blue flower piece and a few small ones throughout the braid. 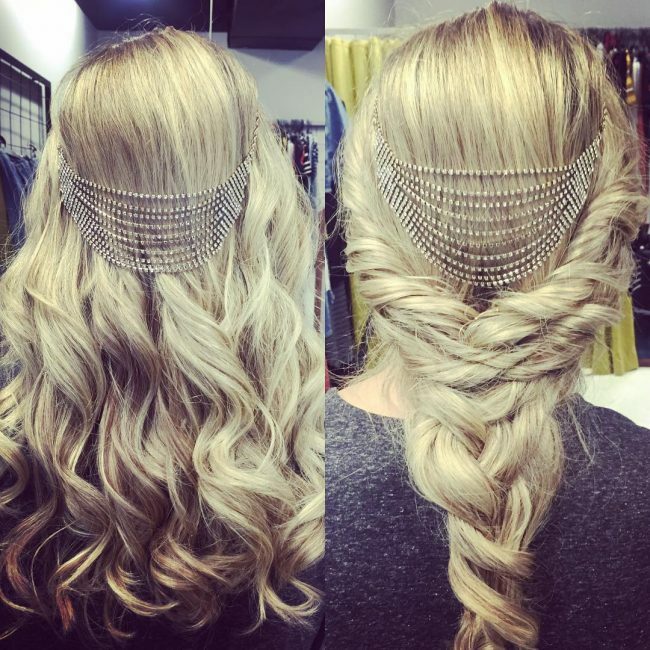 A cute headpiece is vital is you want your long blonde hair to look extra chic. The one of this hairstyle has a fabulous design and some beautiful rocks that make it look very cute. Apart from this the long locks also have an excellent style that comes from pulling and tucking them from the sides before knitting a simple loose braid at the back. Your long brown locks with a hint of blonde may look very charming, but they still need some styling. 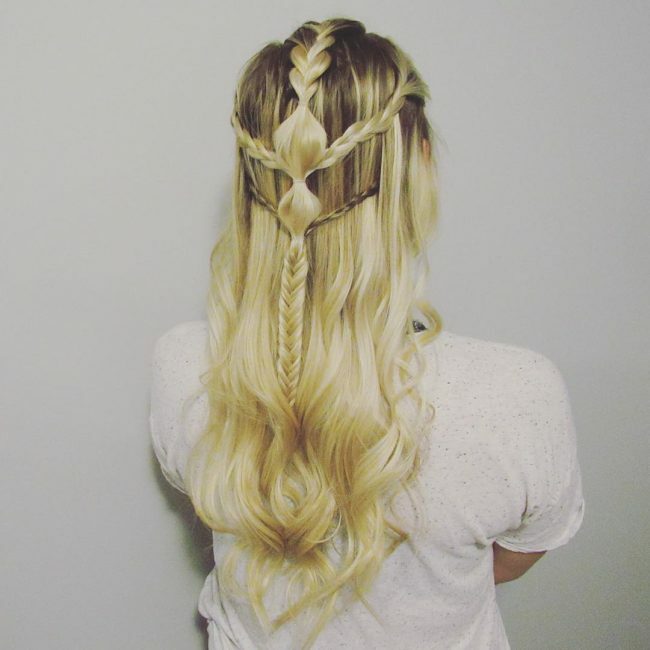 The ones on this design also have some textured waves, and so you only need to weave two neat braids that wrap around the rest of the strands to form some cute braided crowns. 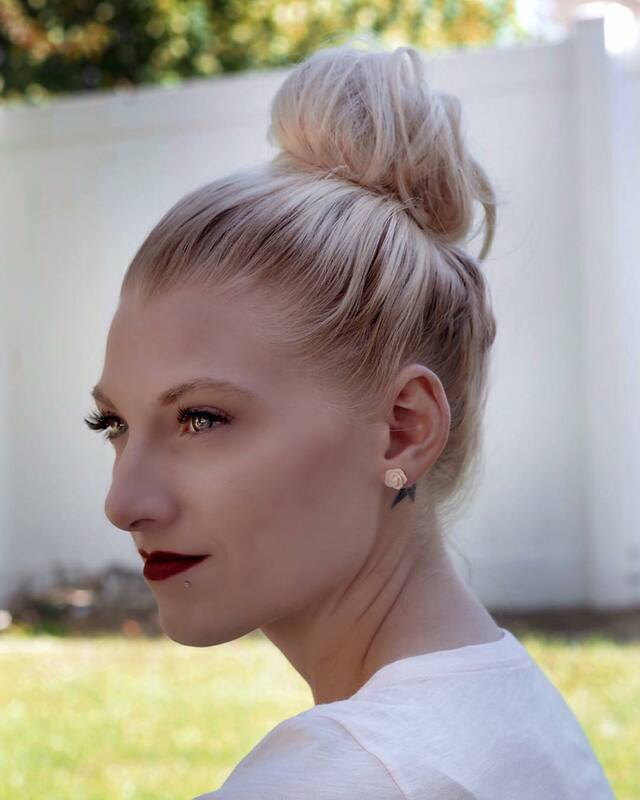 To replicate this fantastic hairdo, you should pull your long strands to the center of the head and tuck them into a medium size and cute bun. However, your headdress will not look this elegant if you do not give your locks a beautiful shade. The tone comes from melting blonde with a subtle light brown hue and shadowing the roots. The fishtail braids in this design create a beautiful half up design that will be ideal for any occasion. To wear this look, you need to sweep back your strands and then use a few of them to knit a loose fishtail twist over the others. However, the texture of the hair and the honey brown to blonde ombre color pattern also help to spice up the hairdo. A half updo is perfect for ladies who want to tame the flow of their mane slightly. 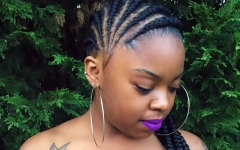 This beautiful one entails weaving some simple braids at the front that start at the center part and flow on the sides while leaving the rest of the locks to flow to the back freely. The massive Dutch braid that incorporates all the strands is the center of attraction in this headdress. Anyone with basic braiding skills can replicate it easily. However, this style would not look this adorable without the gorgeous brown and blonde highlights. Chignons are an excellent alternative to buns, and they also look very stylish. 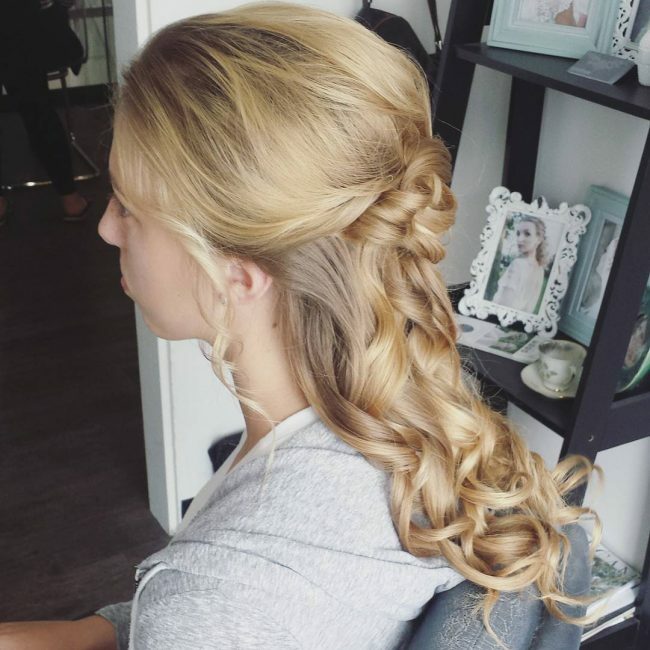 The one of this hairdo has a lovely twisted design, and you will need to use a couple of pins to keep it in place and to maintain its appearance. The color of the hair is also perfect, and it comes from highlighting a chocolate brown base color with a dazzling golden blonde hue. The strawberry hint in this hairstyle helps to create an overall vibrant tone, and it also brightens the locks. Although the color is flawless, the hairstyle is also top notch, and it entails pulling back the hair and twisting it slightly before pinning it into a half updo. There is also a small twist that starts on the center part and flows on the side to enhance the design. 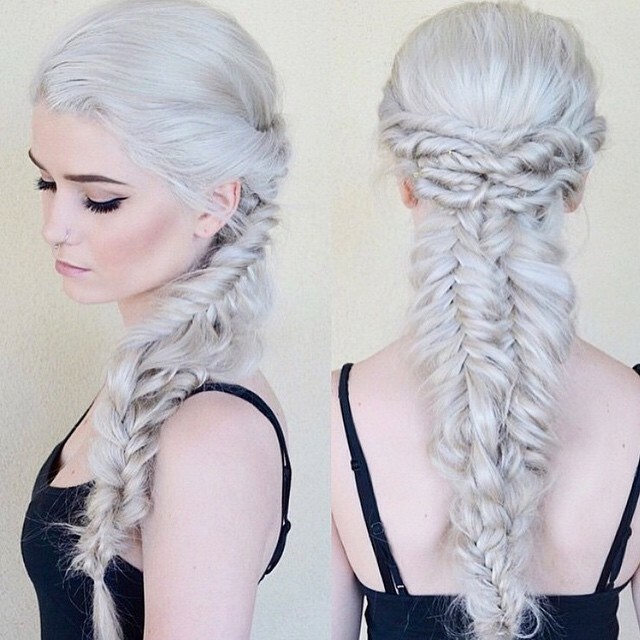 Silver gray is an attention-grabbing shade, and it is what makes this hairdo look exquisite. The long blonde hair also has a beautiful styling that also adds to the beauty. It entails weaving a neat fishtail that starts at the front and flows on one side, and you should leave it hanging over the shoulder. Sometimes you do not need to have very complicated hairdos to look elegant because keeping things simple like in this style can still give you a refined appearance. This design entails using curls or a curling iron to give your long mane some glamorous waves that you should style by sweeping to one side. The color is also stunning, and it is a blend of a dazzling golden blonde hue and chocolate brown. White blonde is one of those shades that will make you stand out from the crowd regardless of the hairstyle that you have. In this design, it also has a hint of silver that helps to enhance the icy look. 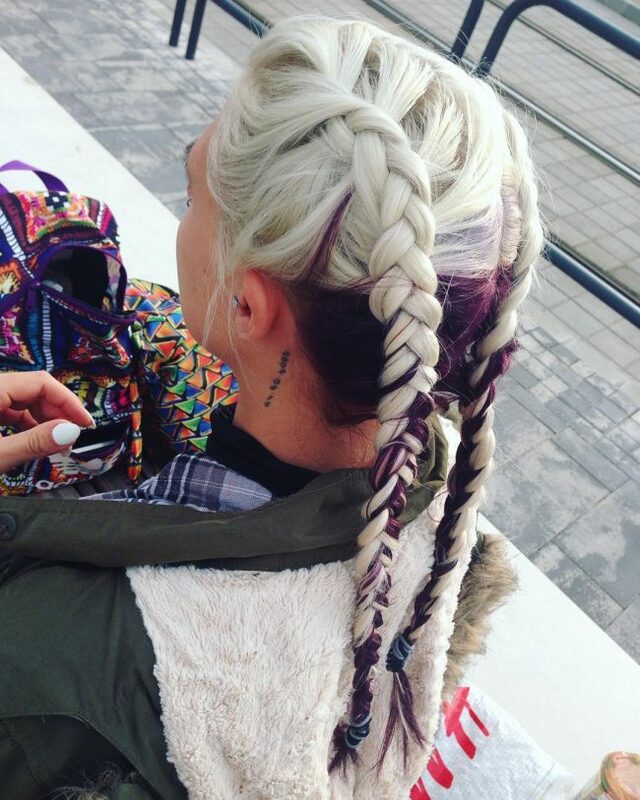 The locks also have an inventive style that entails pulling them back and weaving them into a massive and innovative fishtail with some simple twists above it. These long and wavy blonde locks have an excellent volume and texture that complement the beautiful shade, and so you need not do much to create an elegant style. The hairstyle entails pulling and tucking the strands into a simple crown that wraps around the head to control the flow of the locks. 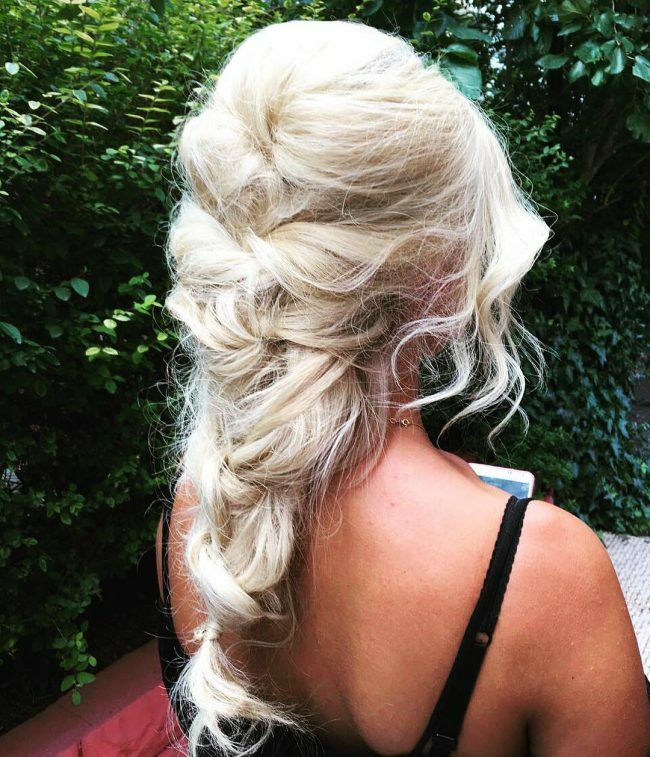 Buns make excellent hairdos for ladies of all ages, but if you want yours to look unique, you should give your strands a distinct shade such as this silky blonde. This shade also looks very natural, and so it will not make it obvious that your hair has some artificial colors, or you have bleached it. 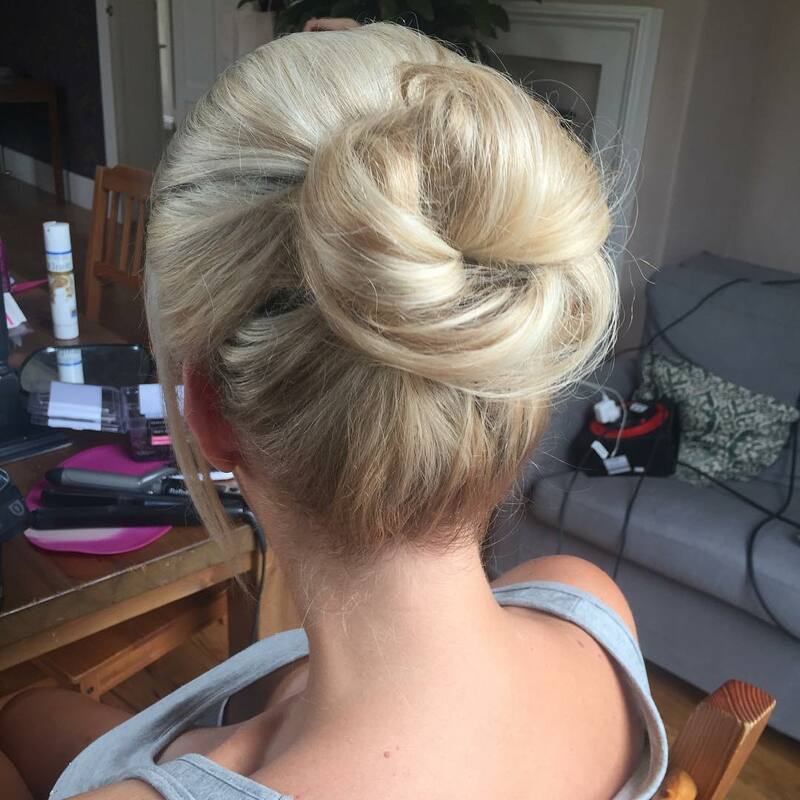 To create the bun, you should pull back the hair, twist and pin it into a loose thick bun. Also, accessorize with a cute brooch to add some elegance to your hairstyle. A few pins are all that you need to create this trendy hairdo. The design involves twisting and pinning your locks in a messy pattern to create a simple upstyle. However, you also need to give the locks a lovely shade and for this, a blend of brown and blonde will be sufficient. Stylish and breathtaking are the two words that best describe this long blonde hair. The locks have a creamy light blonde shade but it is not enough to make them look this chic, and so they still need some skillful styling. For this, you should knit two medium size French braids on both sides while leaving the thick and straight hair in the middle flowing to the back smoothly. Whether you love braids or not, you cannot say no to a stylish hairdo like this one because it is as elegant as it can get. 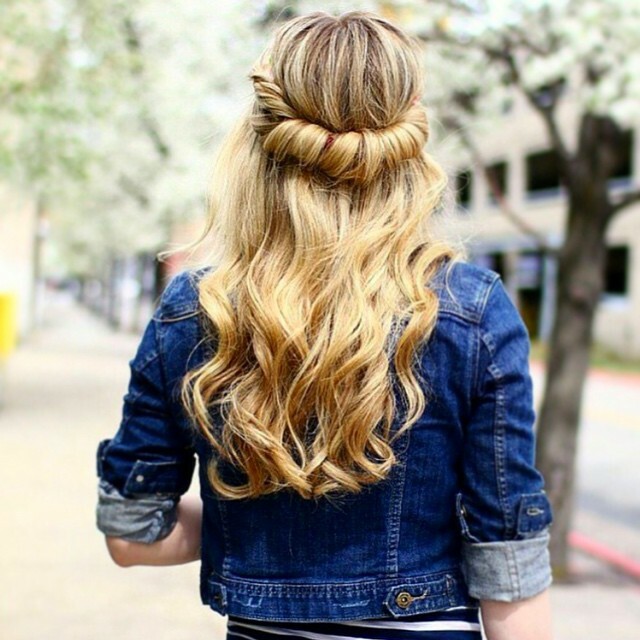 This adorable hairstyle is perfect for a lady that wants to tame the flow of her mane and it entails weaving the long blonde hair into a massive Dutch braid that wraps at the front to create a stylish headband. The color is the first thing that you need to create this gorgeous hairdo. To create this lovely pattern you should transition from a dark brown base color to a blend of light brown and blonde to create a stylish ombre design. And to finish the look you should knit a simple fishtail braid and leave it flowing on the side. Double buns are not a preserve of little girls because even ladies can still wear them and look stylish. The ones in this design start with two neat braids, and they make the buns look more detailed and elegant. These long locks also have a beautiful shade of blonde with some brown streaks that makes the hairstyle adorable. This hairstyle is an excellent choice when you do not have a lot of time to spend on your hair. To create it you only need to brush back your hair and tie it into a simple ponytail and then knit the strands protruding from it into a fishtail. However, your hair should also have a glossy golden blonde shade if you want to look this elegant. A half updo is what you should turn to when you want to control the flow of your hair without tying all of it. In this hairstyle, the long curly locks have an excellent texture that makes styling easy and so you only have to push them back and tie a few with a brooch over the rest. The blend between blonde and brown gives the style a fantastic tone that is also vital for this look. 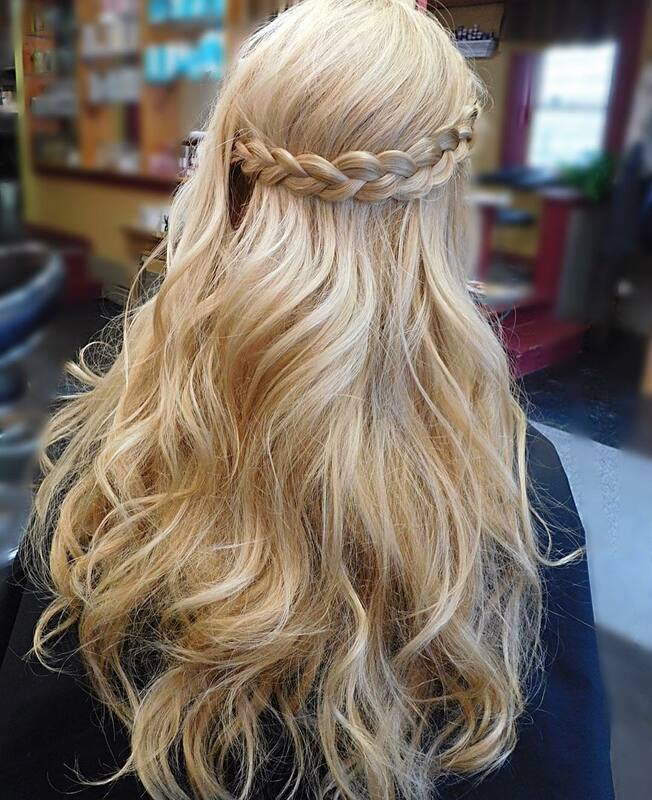 Crown braids are glamorous, and this is more so if you have a beautiful golden blonde hair with a hint of light brown like this one. The twist on this style is medium size and neat but it also leaves a few free locks, and this gives the hairdo a natural looking finish. If you have long blonde hair that is straight and smooth like this one you can always be sure of a polished look as there are endless ways that you can style it. In this particular style you have to brush it back smoothly and then twist it into a small tight bun at the center of the head. The blonde locks also have a hint of brown, and this gives them a very distinct shade. 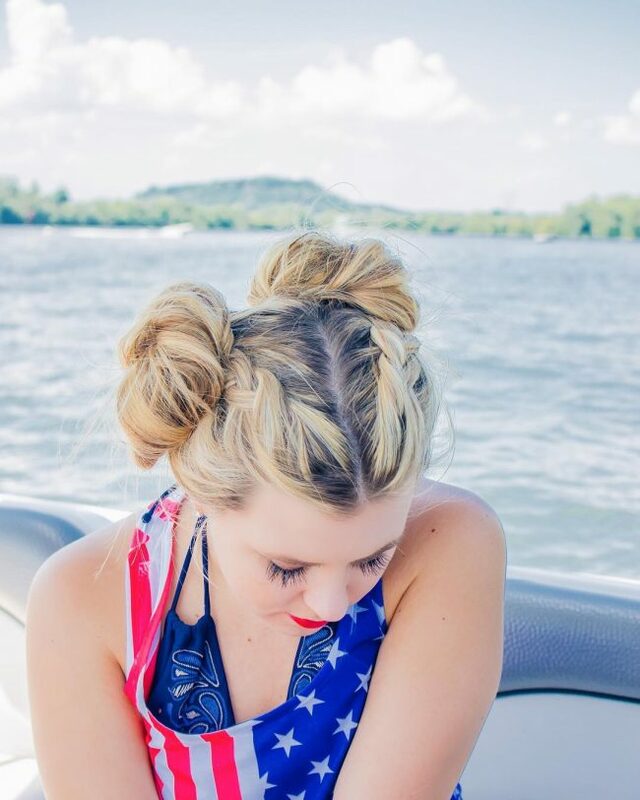 Long hair gives you the freedom to wear almost any style that you can think of, and these pigtails are some of the many designs that you can try out. 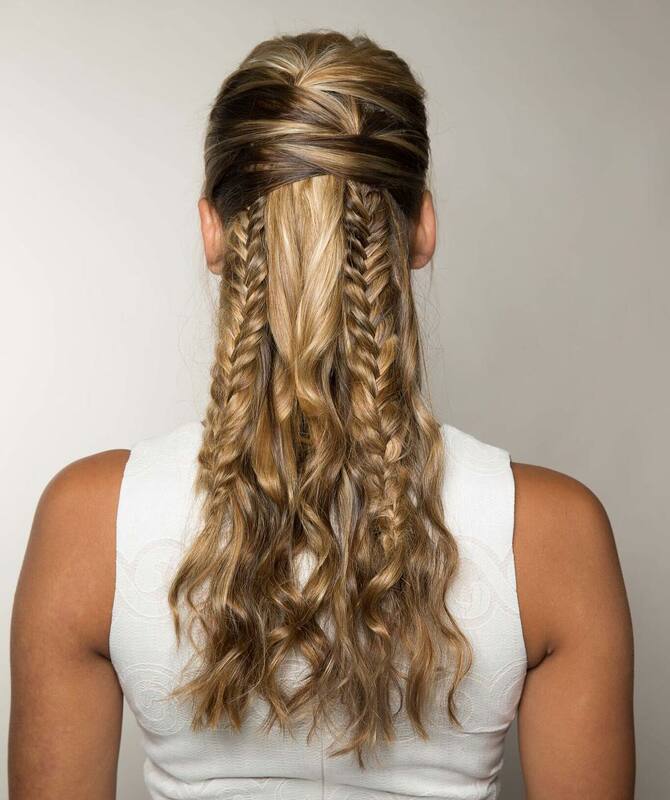 To create this look, you should section the strands into two and weave each part into a pigtail. The long locks also have a beautiful tone that entails transitioning from an icy blonde hue to a purple-red shade in an ombre pattern. Bohemian hairdos are unique, and they will make any woman that knows how to create them look stunning. 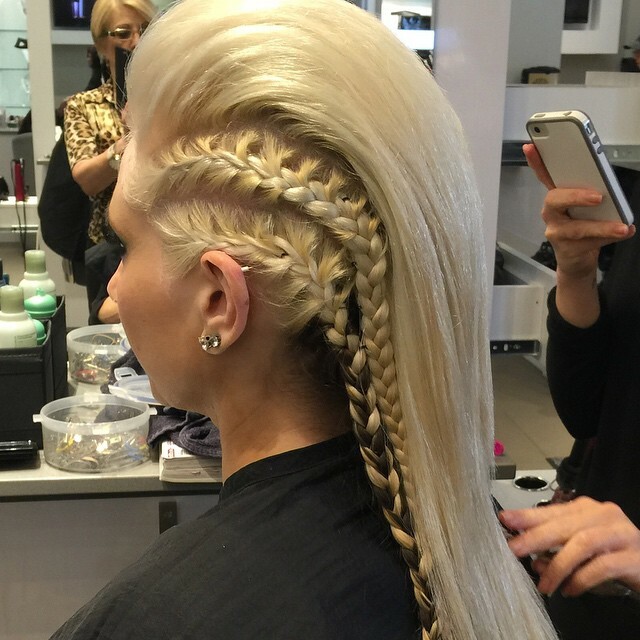 This design entails weaving the long locks into a massive fishtail twist to create a half up design. The color of the strands is also fabulous, and it involves blending ashy blonde hues with golden brown to form some lovely streaks. A thick and long mane with a beautiful color and texture makes styling easy because the hair is already adorable. You do not have to do much with such hair because a simple crown braid like this one is enough. These strands also have a neutral blonde shade that makes them look very natural. 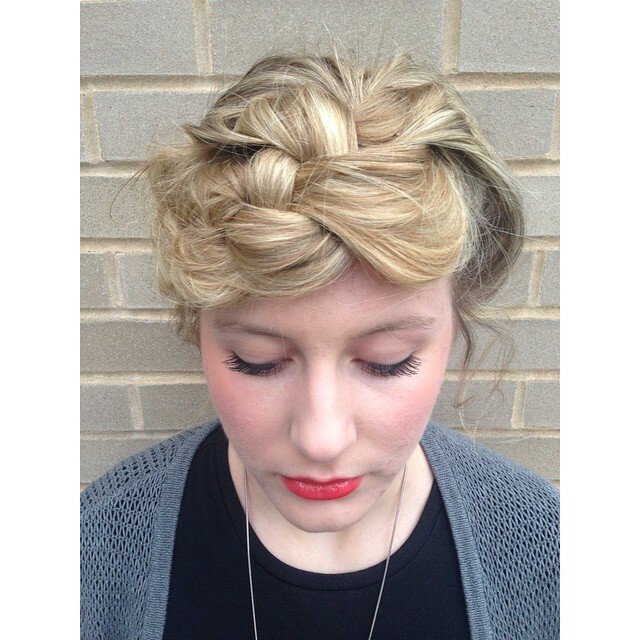 If you have the skills and time to create a fancy hairdo this boho-inspired design is a perfect choice. 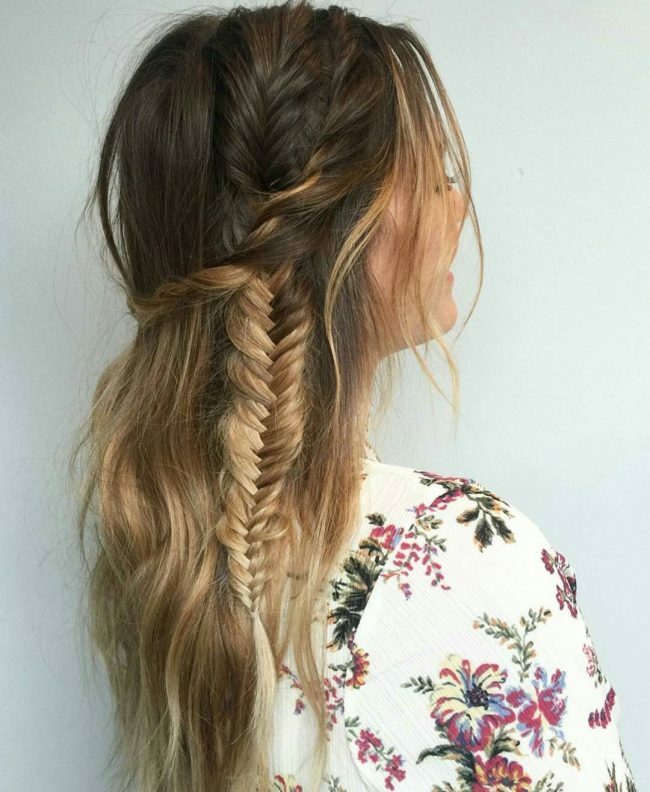 It requires you to weave two medium sized fishtails flowing to the back, but the intricately twisted designs at the top are what make it a unique hairdo. The golden blonde shade with brown streaks is also fantastic. The only thing that might give you a hard time when replicating this headdress is getting the color right, and this is more so if your natural hair is not blonde. However, you only need to bleach your strands into a light blonde shade and give them a subtle hint of brown. The styling is very simple because it only entails pulling back your strands, twisting and tucking them into a medium size bun. 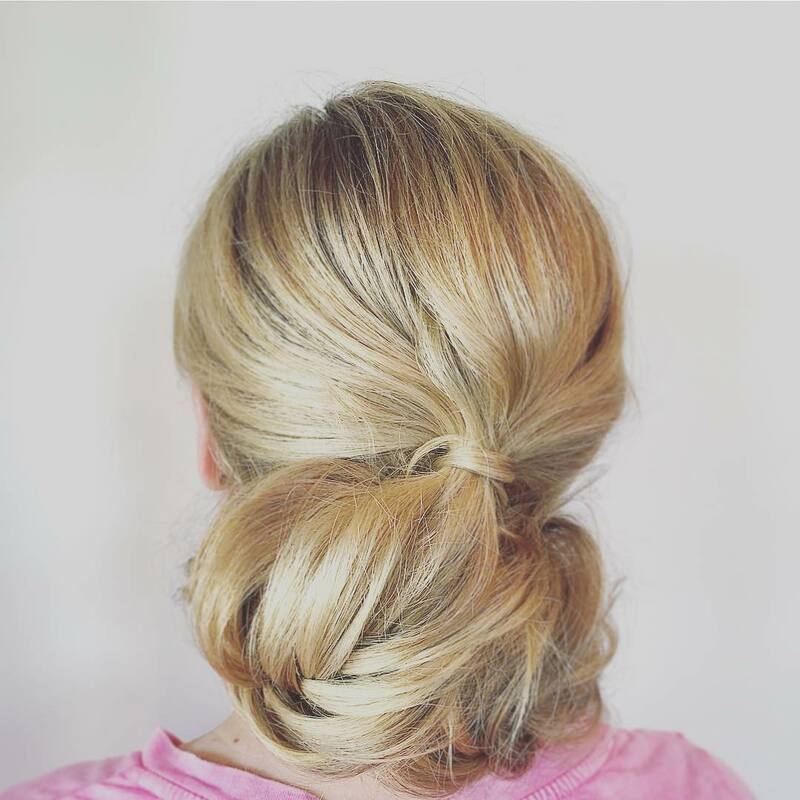 This chignon will only take you a couple of minutes to create, but it still looks very stylish. It entails pulling all the strands to the back and then twisting and pinning them into a chignon. 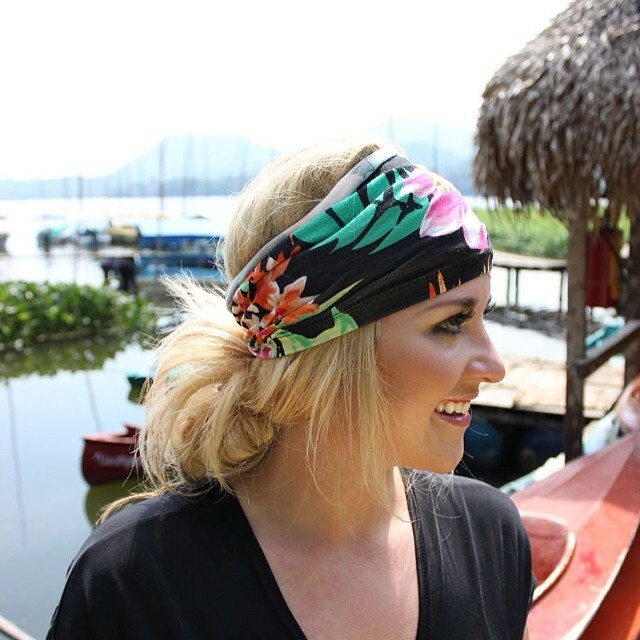 However, this style also has a beautiful headscarf that wraps around the head to create a very fashionable headdress. Trendy hairstyles are more about how you create them and not the style that you choose to wear. 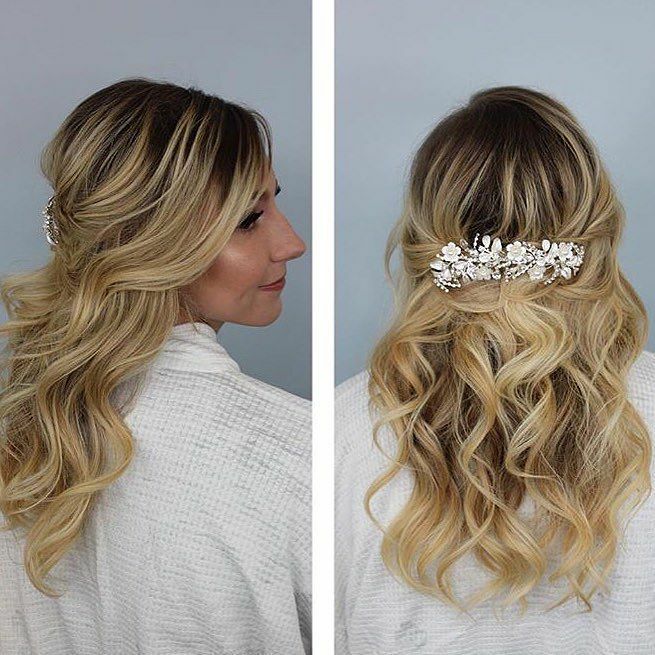 The boho-inspired tucked knot in this style is magnificent and to create it you will first need to tuck your strands from the sides and join then at the center of the head to form the knot. And if you have textured and wavy strands like this that also have a soft and glossy blonde shade then you will look exquisite. Ponytails are easy to make, but you can still spice up yours with a cute braid like in this design. The braid starts at the front and flows to the center of the head where you should combine it with the rest of the hair and use a cute elastic hairband to tie everything into a fly ponytail. 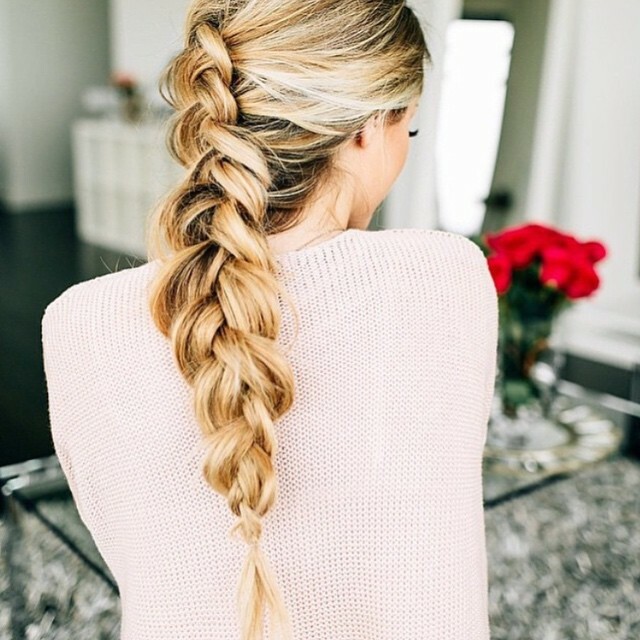 Even if you are not sure of what to do with your long blonde hair, you can never go wrong with a braid. The strands in this design also have an excellent texture and their shade is light brown blonde. 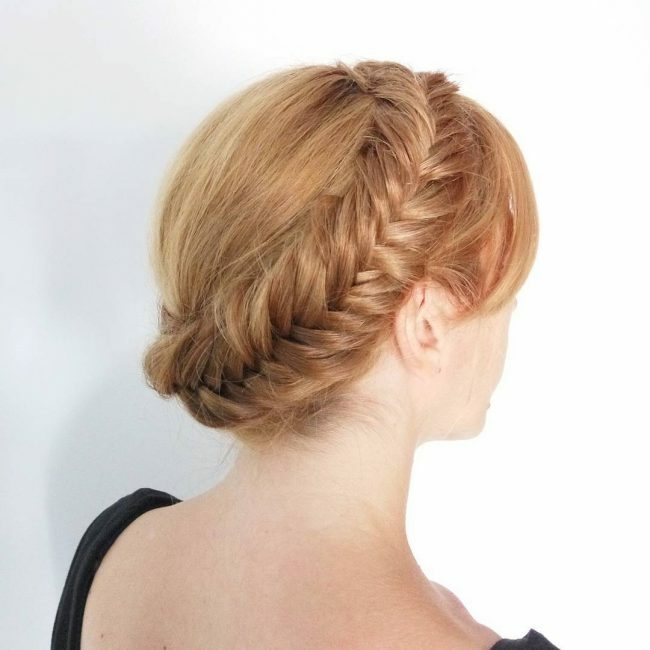 A simple braid hanging on the side with the rest of the locks free-flowing is all the style you need for these locks. Long blonde hair like this one is perfect for ladies who value elegance. The hair has a very inventive styling that will require you to use some elastic bands to create. To wear the style you should brush back the strands and then twist then while using the bands to form some fancy knots. 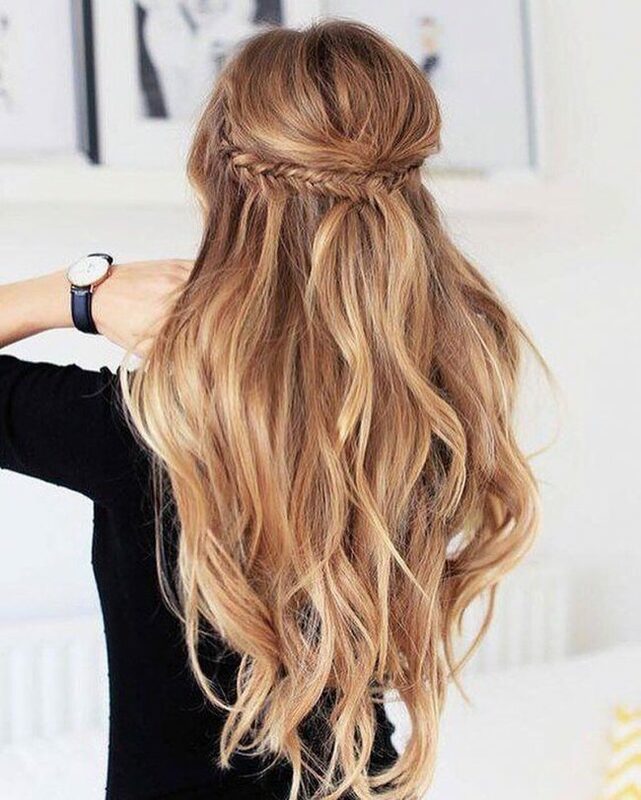 The reddish brown, blonde shade of this hair is fantastic, and it also makes the strands look unique. 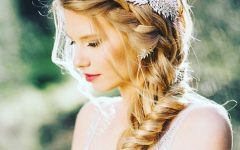 Although the color is what will draw most people to the style, it would not be complete without the adorable fishtail milkmaid braid that wraps around the head to create a lovely crown. It is amazing how a simple boho fishtail can make a huge difference in a hairstyle. The fishtail is loose, and it starts on one side, wraps around the back and finishes on the other to create a chic half upstyle. 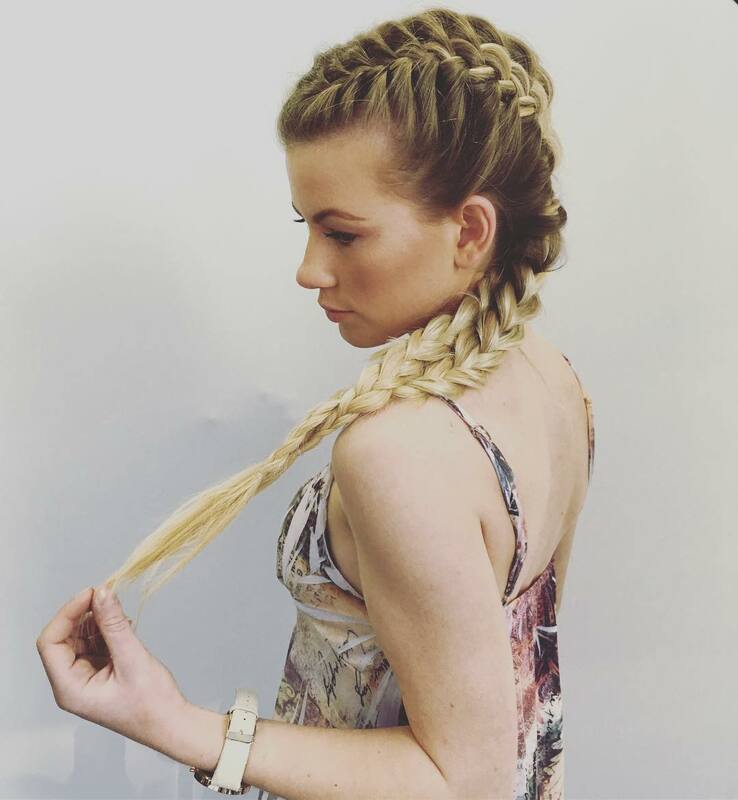 Apart from the braid, the design also has a lovely tone that entails hand painting some blonde streaks to the natural brunette locks. 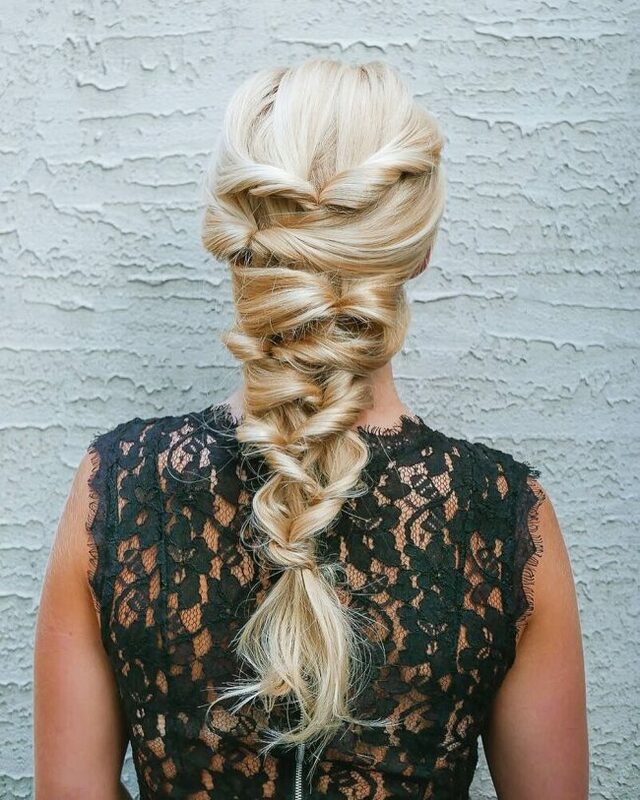 This elegant hairdo has two distinct types of braids that combine at the back to form a cute braided ponytail. 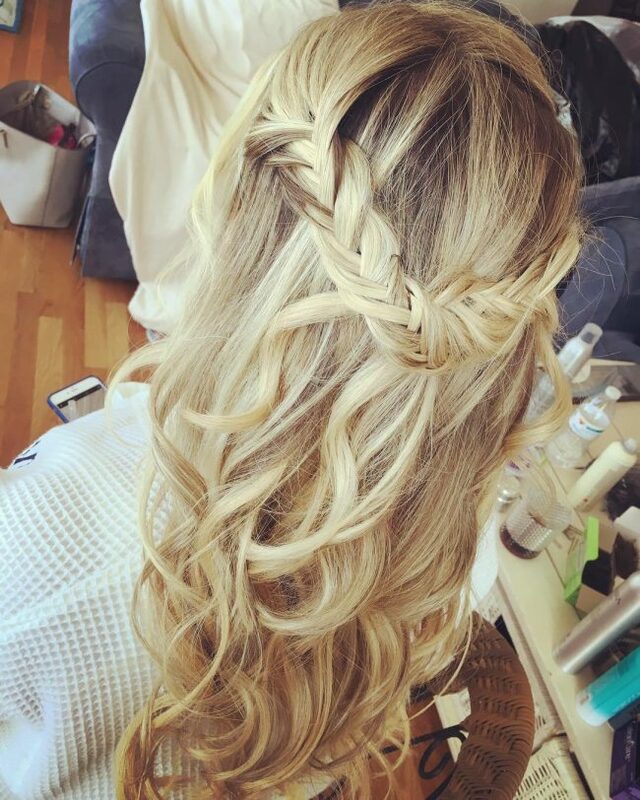 To create this design you should start by weaving a medium size waterfall braid on the side and then have a Dutch twist below it. You should them combine the two at the back to form a braided ponytail. Crown braids are among the few styles that any woman can wear and look stunning regardless of her face shape or hair type. The one on this design is very straightforward, and it has some free locks hanging at the front that make it more attractive. These strands also have a charming caramel blonde shade that makes them look fabulous. Honey blonde is a gorgeous shade that will make your long locks look stunning, and this is more so if it also has a lovely dazzle like this one. The style in this hairdo is also perfect. 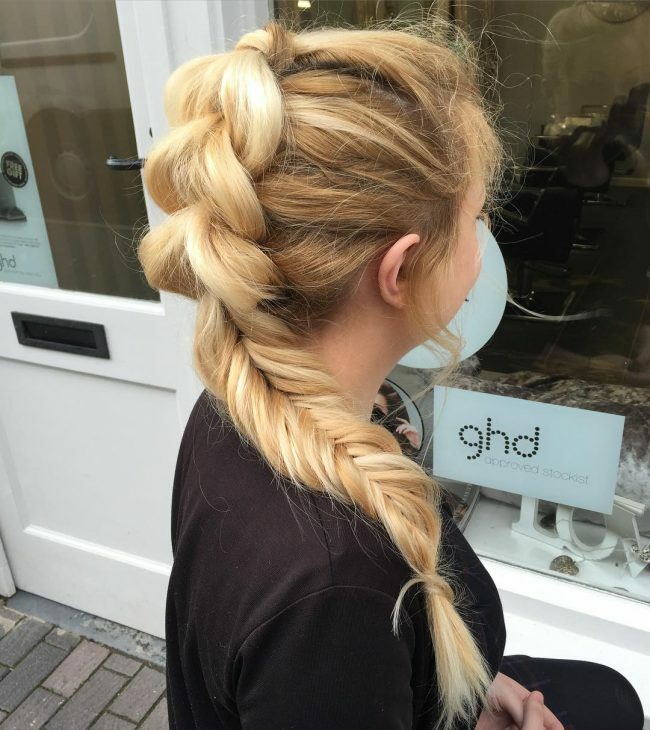 Inspired by the Frozen princess Elsa braid, it entails sweeping the strands to one side and then knitting them into a huge and tight pull-through braid. 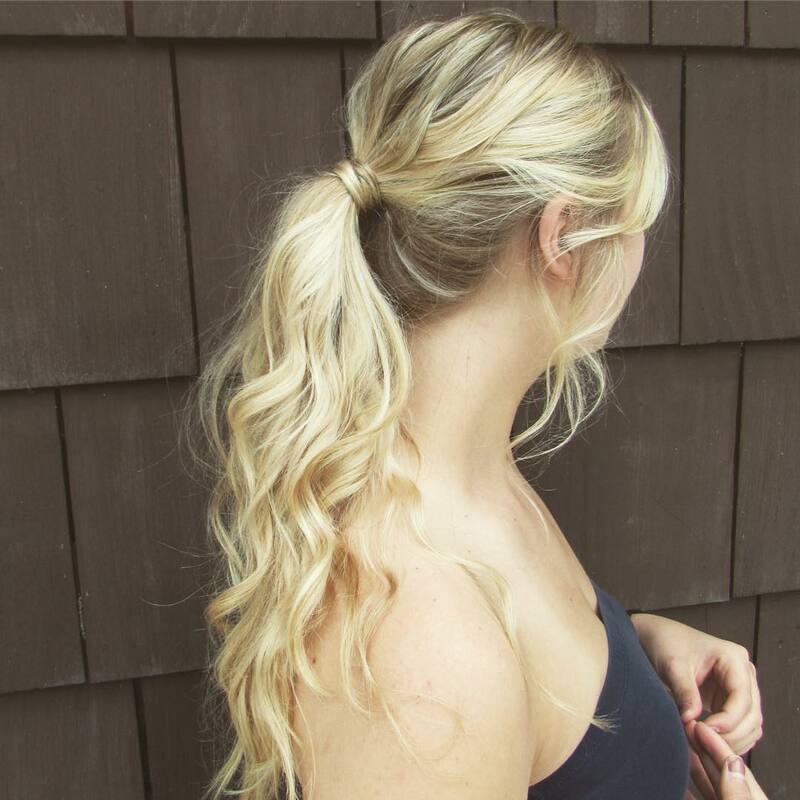 Once you have the twist, you should then style by pushing it over the shoulder. 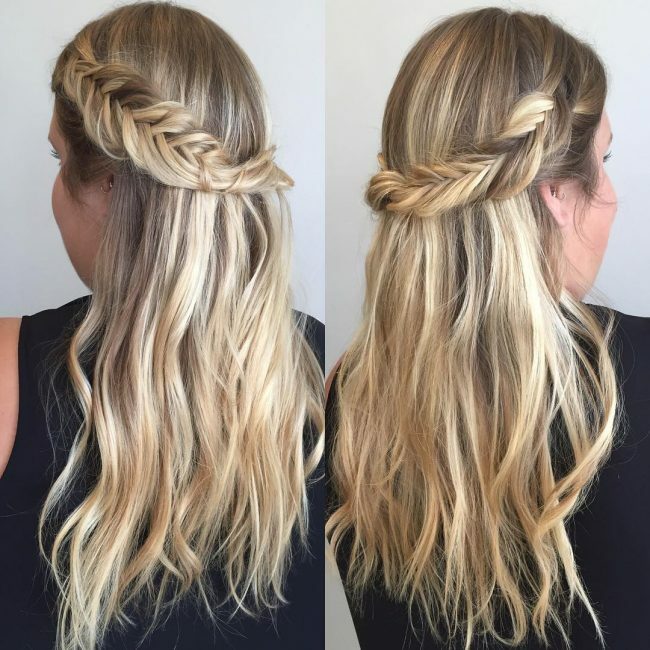 This fancy hairdo is for ladies with a long natural mane, and it involves brushing back the strands and then weaving them into a straightforward and extra-long braided ponytail. The long locks also have a beautiful blend of blonde and brown that gives them a nice tone. You should also spice up the ponytail by adorning it with some cute flowers to turn into a real Rapunzel! 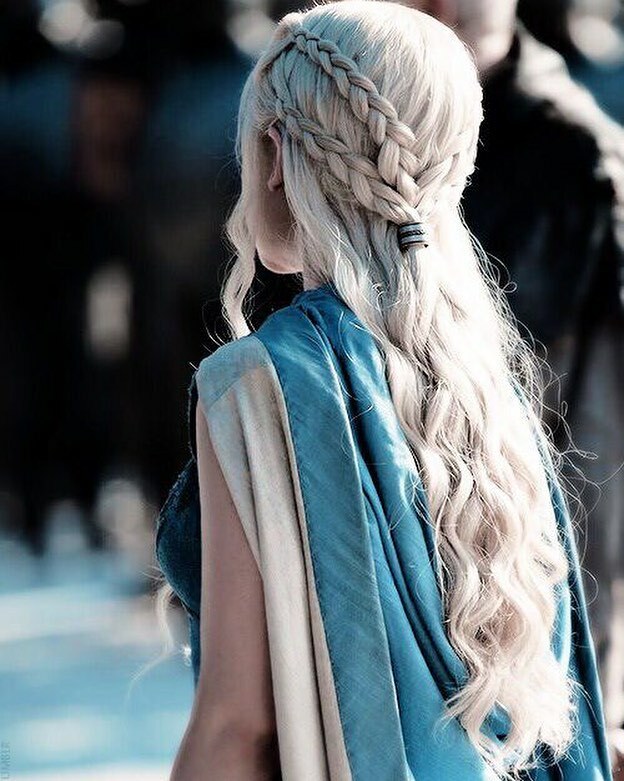 Most modern hairstyles are popular because some celebrities have them and this particular one from "Game of Thrones" is a perfect example of this. It is a fantastic hairdo that involves forming two braids on each side and then joining them into a ponytail over the rest of the locks. Combining the twists create a cute half up design and the beautiful white blonde shade of the long curly locks also helps to enhance it. 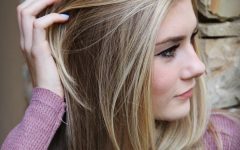 Your long blonde hair gives you the opportunity to wear many hairstyles, and the 55 above are just a few examples. However, even with such a lovely color and size, it is important to choose a hairstyle that goes with your style and is also suitable for the season or event.